What is emptiness? This question at the heart of Buddhist philosophy has preoccupied the greatest minds of India and Tibet for two millennia, producing hundreds of volumes. Distinguishing the Views, by the fifteenth-century Sakya scholar Gorampa Sonam Senge, is one of the most important of those works, esteemed for its conciseness, lucidity, and profundity. Freedom from Extremes presents Gorampa's elegant philosophical case on the matter of emptiness here in a masterful translation by Geshe Lobsang Dargyay. Gorampa's text is polemical, and his targets are two of Tibet's greatest thinkers: Tsongkhapa, founder of the Gelug school, and Dolpopa, a founding figure of the Jonang school. 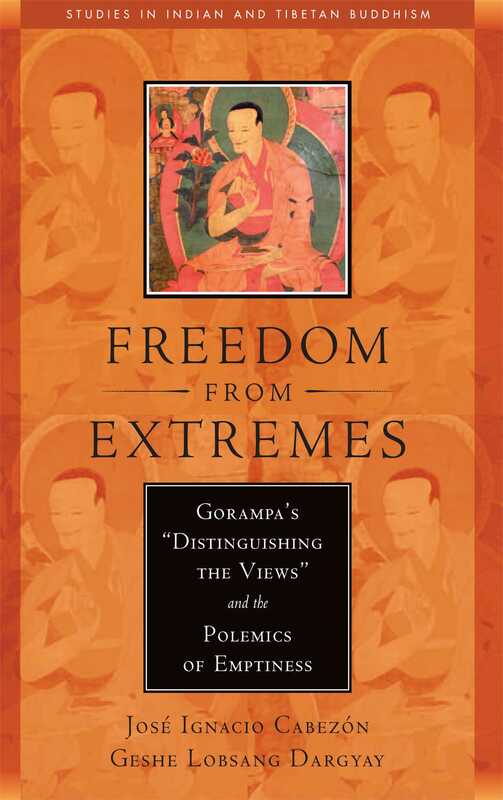 Distinguishing the Views argues that Dolpopa has fallen into an eternalistic extreme, whereas Tsongkhapa has fallen into nihilism, and that only the mainstream Sakya view - what Gorampa calls "freedom from extremes" - represents the true middle way, the correct view of emptiness. Suppressed for years in Tibet, this seminal work today is widely regarded and is studied in some of Tibet's greatest academic institutions. Gorampa's treatise has been translated and annotated here by two leading scholars of Tibetan Buddhist philosophy, and a critical edition of the Tibetan text on facing pages gives students and scholars direct access to Gorampa's own words. Jose Cabezon's extended introduction provides a thorough overview of Tibetan polemical literature and contextualizes the life and work of Gorampa both historically and intellectually. Freedom from Extremes will be indispensable for serious students of Madhyamaka thought. "Gorampa Sonam Senge (1429 - 89) is among the the Sakya tradition's greatest scholars, and his works have been considered seminal by many later masters of the school. In his Distinguishing the Views, Gorampa, critiques two divergent interpretations of Middle-Way philosophy: those of the Jonangpa and those of Tsongkhapa (1357-1419), whose followers had established doctrinal hegemony in many Tibetan seminaries. Gorampa composed this text early in his career, and its substance presages themes he returned to years later in his summa of the Madhyamaka, the Dgongs pa rab gsal. Gorampa's trenchant criticisms have not lost their power. The Tibetan 'modernist' Gendun Choephel, after reading this long-banned work for the first time in the 1950s, shed tears and uttered high praise for its author. Now with Cabezon and Dargyay's careful translation and notes, Western readers can follow the same discussions, many of which lay at the heart of Tibetan philosophy." "A magnificent translation of a pivotal Tibetan examination of the nature of reality. Essential for comprehending the variety of views on the middle ground." "Jose Cabezon and Geshe Lobsang Dargyay have made a major contribution to the library of alternative Tibetan views of Madhyamaka. The text translated here is a classic of Tibetan polemical literature in which the great Sakya master Gorampa Sonam Senge presented refutations of the Madhyamaka explanations of both Dolpopa and Tsongkhapa. A wide-ranging introduction sets the stage for the text's meticulously annotated translation." "Gorampa was a central figure in what was perhaps the most fertile period of Tibetan Buddhist philosophical and intellectual history. In his polemic tract, Distinguishing the Views, he not only sets forth his own view of Madhyamaka, one that he considers to be the orthodox Sakya view, but he also dedicates significant sections of the text to refuting the views of two towering Tibetan figures who were at one time associated with the Sakya tradition: Dolpopa Sherab Gyaltsen, founder of the other-emptiness or zhentong view, and Je Tsongkhapa, the founder of the tradition that came to be known as Gelug. The fully annotated translation of Gorampa's text and the historical Introduction that contextualizes the text, the ideas, the politics, and the role of polemics in Tibetan Buddhism make an outstanding new contribution to our understanding of Tibetan Buddhist philosophical history. Cabezon acknowledges in the preface the irony that one of the most famous criticisms of Tsongkhapa's views would be 'brought to the attention of a Western audience by two scholars trained in the great Gelug academies (Geshe Dargyay at Drepung and I at Sera).' But he notes that not only does enthusiasm for good philosophical arguments transcend sectarian rivalries in the Tibetan Buddhist tradition, but that often the greatest insight into one view comes from serious engagement with its critics. This is yet another excellent and welcomed addition to Wisdom Publications' academic series: Studies in Indian and Tibetan Buddhism." "Jose Cabezon and Geshe Lobsang Dargyay's translation of Gorampa's Distinguishing the Views (Lta ba'i shan 'byed) is a precious gift to scholars of Buddhist Madhyamaka philosophy."